If you want to grow your business, then you need the best email marketing software. Email marketing software will allow you to run successful marketing campaigns and help you take your business to the next level. In this article, we’ll share our expert picks for the top 10 best email marketing software. Why is Choosing the Best Email Marketing Software Important? Email marketing is one of the most affordable and effective ways to market your business, increase sales, and connect directly with customers. You can’t use Gmail to run an email marketing campaign, and that’s why you need email marketing software. A good email marketing software will allow you to create beautiful-looking emails, allow you to segment users into groups, track the performance of your campaigns, and, most importantly, prevent your emails from going into the Spam folder. If you don’t choose the right email marketing software, you run the risk of sending ugly emails to consumers. Or, they might not even receive your email at all. That’s not only a failed marketing campaign, but a waste of money too. Being able to send personalized messages straight into your customers’ inboxes and get access to features that’ll improve the success of your email marketing campaign is important when choosing the best email marketing software. But what if you don’t have anyone to email? Don’t worry, you can easily build an email list to market your business to by using a tool like OptinMonster. OptinMonster is a user-friendly lead generation software that allows you to easily build popup optins that’ll get you more email subscribers. With their drag and drop builder, in minutes you can create effective popups. For instance, you can create an Exit-Intent® popup that’ll track when a user is about to leave your site and send them a targeted message at exactly the right time. So, before users leave your site, they’ll be encouraged to give up their email addresses. With a tool like OptinMonster, you can build a massive email list in no time. Check out our recommendations for the 10 best email marketing software to grow your business in 2018. Constant Contact is one of the most popular and powerful email marketing software available. In minutes you can create a beautiful email marketing campaign by choosing one of their many gorgeous templates. They also offer an easy-to-use drag and drop editor so you can fully customize your messages to fit your brand. Constant Contact boasts a number of useful features including the ability to monitor your email campaign success, it can send automatic welcome emails for you, and even help you test your subject line to make sure your emails get opened. 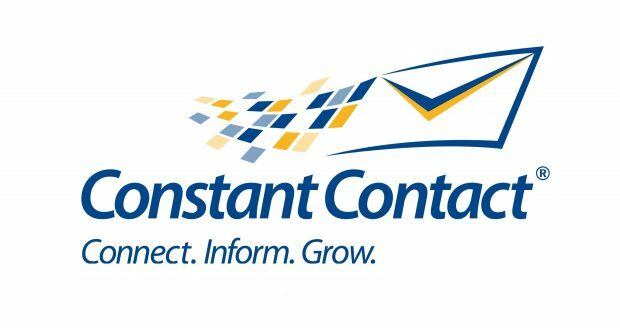 You can start using Constant Contact for free for a limited time with their free 60-day trial, and their service starts at $20 per month. But with the $20/month plan you can only email up to 500 people. So if you want to be able to send more emails, you’ll have to upgrade to one of their other plans. MailChimp is one of the most well known and trusted email marketing software and is a great option to run your email marketing campaign. One of the biggest perks about MailChimp is the pricing. They offer a totally free plan for up to 2000 subscribers and 12000 emails per month, which is great if you’re just starting out. When you’re ready to grow your email list and your business, you can then upgrade your account. They have plans for unlimited number of subscribers and emails starting at only $10 per month. With MailChimp you can easily create awesome emails that will grab the attention of readers and their service can be integrated with platforms like Shopify, Salesforce, and WooCommerce. You can also set up automation in just a few clicks so your customers get the right emails at the right time like welcome series, cart abandonment, birthday recommendations, and order notifications. Get Started with MailChimp Today! With Campaign Monitor you get access to hundreds of professionally designed and mobile-optimized email templates that will impress your audience. You can also use their drag and drop builder to create an email that’s completely customized to your business. Another cool feature they have is their unique visual journey designer to help keep your audience engaged and lead them to buy. You can get started for free without having to provide your credit card information and their Basic plan is just $9 per month. Campaign Monitor also has award-winning customer service with a 99 percent customer satisfaction rate in case you run into any issues. 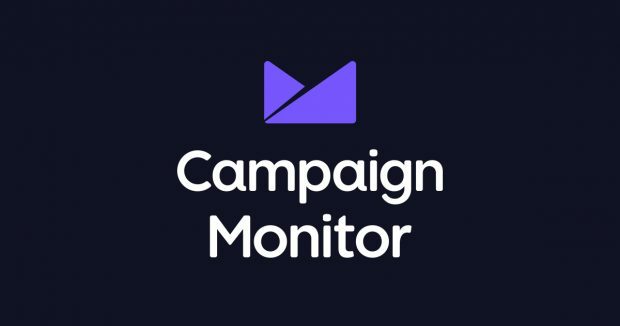 Get Started with Campaign Monitor Today! 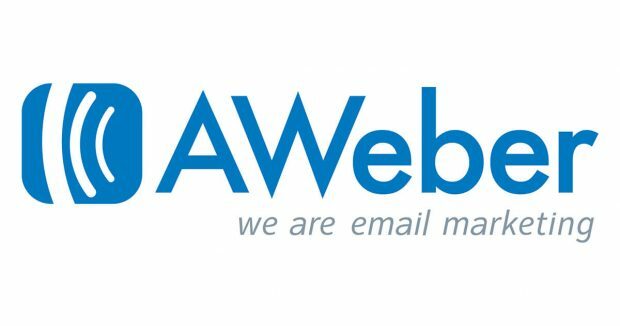 AWeber is another great software option for your email marketing needs. They offer over 700 mobile responsive email templates to choose from. And their drag and drop editor makes it easy to adapt them to fit your needs. You can also apply tags to emails to trigger automated email campaigns based on opens and clicks, automatically send follow-up emails, and segment your subscribers. 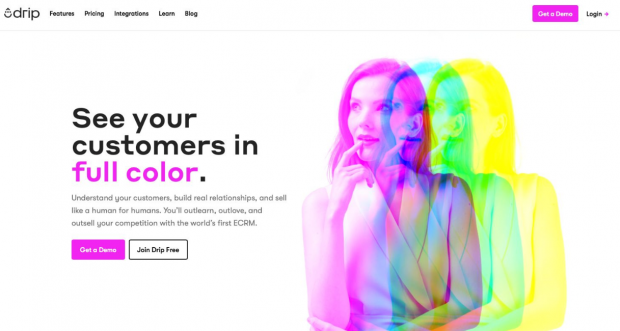 Their Email Newsletter feature will automatically turn your blog posts into great-looking emails. AWeber has a free 30 day trial and offers plans starting at $19 per month for 500 subscriber and unlimited emails. You also get access to a huge library of how-to’s and tutorials to help you out along the way. Get Started with AWeber Today! ConvertKit is a great option for beginners, experienced and advanced marketers alike. They have a number of different features that will turn your business’s email marketing campaigns into a success. One of their unique offerings includes a drag and drop sequence builder that helps you to easily create personalized automated emails to scale your business. This platform also offers easy to embed optin forms that will help you grow your email list, the ability to segment your contacts based on their history, and more. They even offer a number of videos and workshops to help you create an awesome email campaign. ConvertKit has plans starting at $29 per month for 0-1000 subscribers and unlimited email sends and they provide 24/7 live chat and email support. Get Started with ConvertKit Today! Drip is an awesome email marketing software for eCommerce, as well as bloggers and marketers. This software option comes with numerous features to help you sell your products to your email list. It’s easily integrated with most eCommerce platforms, Facebook ads, payment processors, online course delivery apps, and more. You can go beyond basic email and build gorgeous emails using their Text Builder and Visual Email Builder. Drip will also help you build email campaigns, one-off emails, tailored Facebook ads, websites and landing pages, postcards, and text messages. Their basic plan costs $49 per month, which makes it the most expensive choice on this list. But if you need quality software that’s super powerful then this is the perfect option for you. Get Started with Drip Today! With GetResponse it’s easy to create stunning emails that your subscribers will love. Choose from over 500 predesigned templates to customize or start from scratch and build your own email. You also get access to a library of 1000 free iStock images to help design your email. You can also use the in-editor mobile preview to make sure your email looks good on all devices as you’re building it. With GetResponse you can also personalize emails to each subscriber. Other features include a drag and drop autoresponder organizer, advanced segmentation features, real time activity tracker to watch your emails as they get opened, and more. 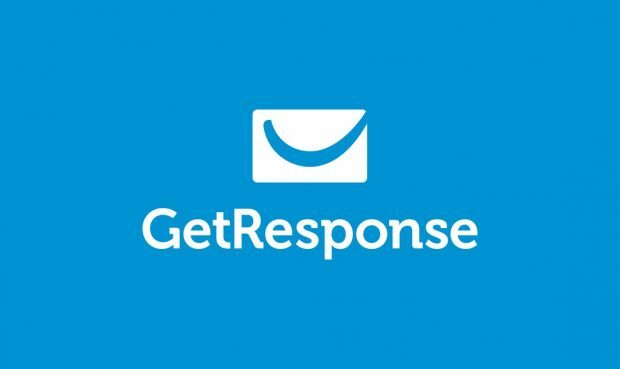 You can get started with GetResponse for as little as £10 a month for 1000 email subscribers, which is around $13 a month US. Get Started with GetResponse Today! ActiveCampaign is another great email marketing software and they also offer marketing automation, sales and CRM, and messaging services. 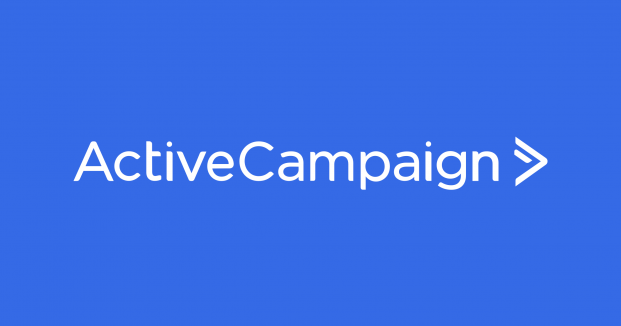 You can connect ActiveCampaign with over 150 apps including PayPal, WooCommerce, and Facebook. Unfortunately, they only offer around 25 email templates to help design your emails. But you can customize them to fit your company and personalize them for your email subscribers. Some other features that are available with ActiveCampaign include free image hosting. This feature allows you to upload an unlimited number of images for your campaigns. They also offer the ability to add tags, get notifications and create deals when an email is clicked, geotracking, site tracking, and more. Their plans start at $17 a month. You can get started with them for a 14 day free trial without giving up your credit card information. Get Started with ActiveCampaign Today! 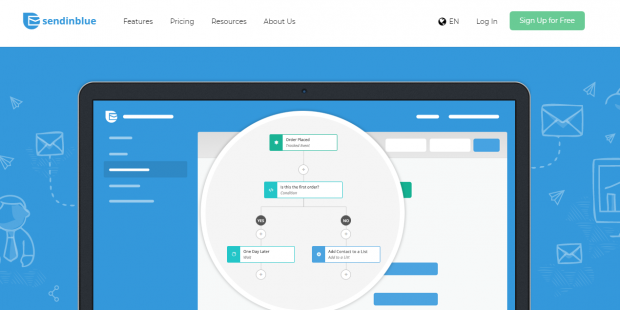 SendinBlue has all of the features you need in an email marketing software. Create professional-looking emails in a few minutes with their drag and drop builder. They offer a number of great features including an HTML editor, responsive template gallery, email testing, contact segmentation, real time statistics, heat maps, and more. You can send 300 emails per day to an unlimited number of contacts with their free plan. If you want to upgrade and send more emails, their paid plans start at 19€ per month, which is around $22. Get Started with SendinBlue Today! 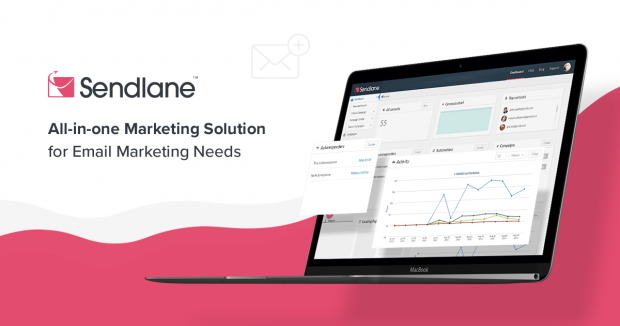 Sendlane makes email marketing simple with their easy to follow step-by-step instructions. You can integrate Sendlane with your website to track movement, purchase history, location, and more. This helps to create emails for your customers that encourage them to buy. They offer an easy to use drag and drop email editor, email retargeting, list management, real time reporting, scheduling, and many other useful features. Try Sendlane for free with a 14-day free trial, after that their paid plans start at $18 per month. They also provide 24/7 live chat and email support to help handle any issues you come across. Get Started with Sendlane Today! We hope you’ve enjoyed this article on the best email marketing software to grow your business. Hopefully you’ve found the best option for your business needs. If you found this article useful, you might also enjoy our post on the top 8 WordPress plugins to step up your SEO game! For more tips and insights on building a website, keep following our blog!